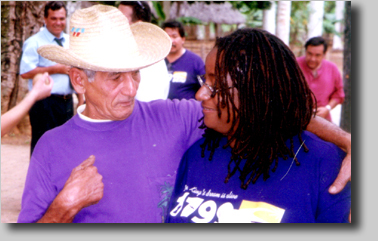 Director Lorna Green (right) speaking with Cuban farmer, who like all Cubans, has free healthcare. Please take a look at our Electronic Press Kit. If you need more information, don't hesitate to pop an e-mail to us at nicomo@sbcglobal.net. As more people find out about BLOODLETTING, people have asked us for resources to change the for-profit healthcare system in this country - and more about Cuba's healthcare system. Here are some links for you. This is the group that is organizing to support Senator Sheila Kuehl's bill, SB 840, legislation which will save Californian's millions in healthcare costs while ensuring coverage for all Californians. This site is enormously informative, plus has immediate ways for people to get involved to help. With emphasis on ACTION, this site informs on healthcare reform across the country. It includes links to healthcare reform organizations in every state. Campaign for National Health Care Now! A national campaign for universal healthcare? You bet! This organization is pushing for it, and has ways for everyone to be involved. It has wonderful statistics, comparing our US system to systems in other countries where healthcare is nationalized. An excellent resource healthcare activists and organizations throughout the U.S. Site includes healthcare news, films and videos, statewide organizations, as well as great commentary on politics of healthcare in our rich country. Every year, for the past 17 years, Pastors for Peace have coordinated a caravan to Cuba to provide humanitarian aid to Cubans, and help educate Americans about our neighbors. In June 17, 2006, the caravan will begin educational presentations and aid collections throughout the US and Canada. On July 2, a participant orientation begins in Texas - and the trip begins. This inspirational Cuban University program provides medical school training to become a doctor, completely free, to non-Cubans. Designed especially for persons of color and/or low income students, the program admits students fulfilling certain prerequisites and a commitment to practice medicine in poor and underserved communities in the U.S. after graduation. IFCO (interreligious Foundation for Communityh Organization) administers the program here in the U.S.